A new study published in the journal Molecular Psychiatry reveals that patients who suffer from major depression are more likely to have a smaller hippocampus (the region of the brain that’s primarily responsible for the formation of memories) than that of a healthy individual. This is especially the case for people who have recurring depression. The team of researchers, who gathered data from the U.S., Europe, and Australia, examined MRI brain scans of 7,199 healthy participants and 1,728 individuals diagnosed with major depression, as well as clinical records for depressed patients. The team discovered that 34% of participants who experienced only one major depressive episode had a smaller hippocampus, compared to healthy participants. However, 65% of depressed patients with recurring episodes had a smaller hippocampus, which may indicate that the longer depression lasts, the greater effect it has on mechanisms in the brain. 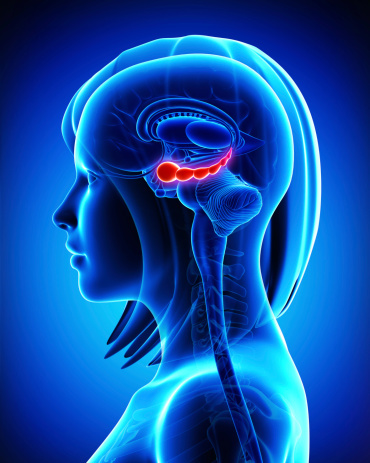 A smaller hippocampus was also observed in patients whose depression started before the age of 21, which further supports the belief that depressed youth are likely to experience recurring depression. The study’s authors stress that more research needs to be done to further examine the cause-and-effect relationship between the hippocampus and depression—does major depression cause a smaller hippocampus, or do hippocampus abnormalities predispose individuals to depression? Researchers are hoping that by effectively treating the first signs of depression, they may be able to prevent the onset of brain changes associated with recurring depression. Major depression affects roughly one in six people and is characterized by ongoing feelings of frustration, sadness, and anger that interfere with daily life. Symptoms can last anywhere from weeks to even years. Paddock, C., “Major depression tied to smaller hippocampus,” Medical News Today web site, July 2, 2015; http://www.medicalnewstoday.com/articles/296188.php.